At the outbreak of the First World War, Colin Unwin Gill joined the Royal Garrison Artillery, but in 1916 was seconded to the Royal Engineers as a camouflage officer. With his knowledge and Slade School training, Gill was asked to create a large work on an artillery subject, which would then form part of a great memorial gallery. 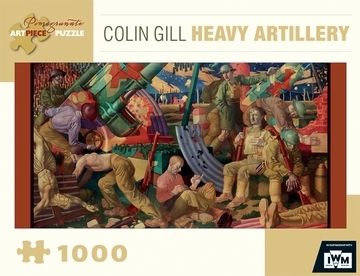 Lack of funding after the war meant the gallery was never completed and Gill’s painting, Heavy Artillery, was given to the Imperial War Museum. Its intricate imagery—a battery of camouflaged 9.2-inch howitzers, infantrymen resting upon their return from the line, a soldier lying on a sheet of corrugated iron—highlights the chaotic themes of war.